“I cannot explain the excruciating pain that I feel in all my joints. I can barely flex my fingers because of the stiffness from arthritis. But my daughter’s cries hurt me more than anything. 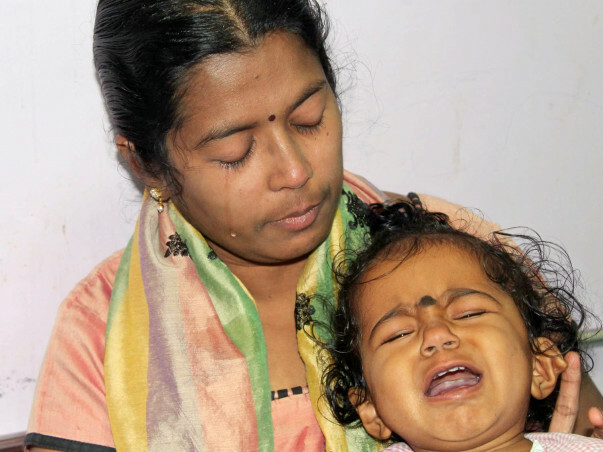 I can bear physical pain, but my daughter’s suffering is unbearable.”-Sridevi, mother of 1-year-old Supritha. Sridevi and Ramesh had named their child just last month. 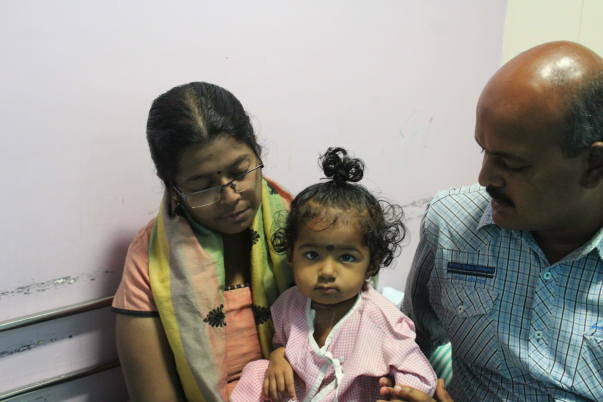 However, as cruel fate would have it, it was around the same time that Baby Supritha was diagnosed with blood cancer. Sridevi’s health issues and Ramesh’s financial problems have made life a living hell for this family. Their daughter is dying, but these helpless parents have exhausted all means to get her urgent treatment. When Sridevi became pregnant, her happiness knew no bounds. She was happier when she gave birth to a baby girl around a year ago. However, the baby was found to have a hole in her heart. In addition, her platelet count was also very high. She had to spend 7 days in the NICU because of this. “My baby looked fine, but she had some issues at birth. I remember praying to God to give her back to me safely. And it happened – we were able to take her home after 7 days of hospitalization. I thought my prayers had been finally answered and swore to God that I would take care of her well.”-Sridevi. Sridevi and Ramesh were amazed when Supritha started talking a little before she turned 1-year-old. She had started saying ‘Amma (mother)’, ‘Appa (father)’ and ‘Anna (brother)’ very clearly. She was also very playful and energetic, always running around the house. But one day, she got a fever that just refused to go away. “She was so irritable and tired. Her body was so hot and nothing we did was able to control it. 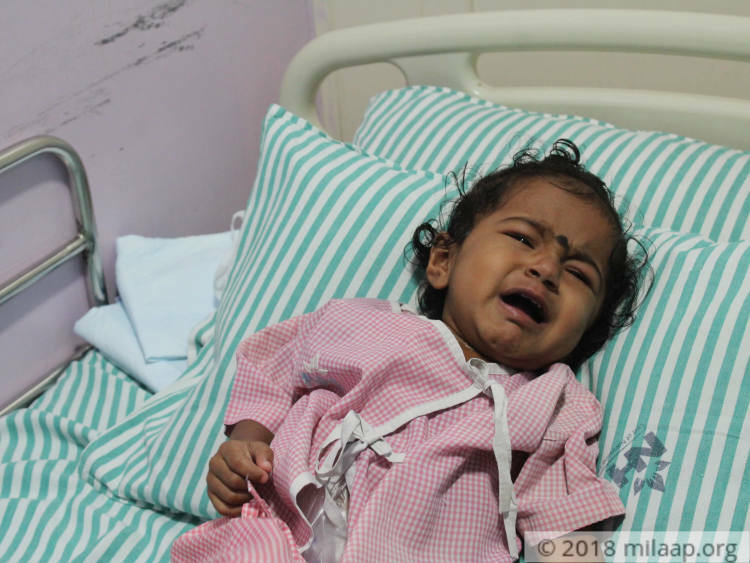 We took her to many doctors in our hometown of Krishnagiri, but she didn’t get better. Blood tests showed that she had elevated WBC and platelet levels. The doctors told us to take her immediately to Bengaluru for better treatment.”-Sridevi. 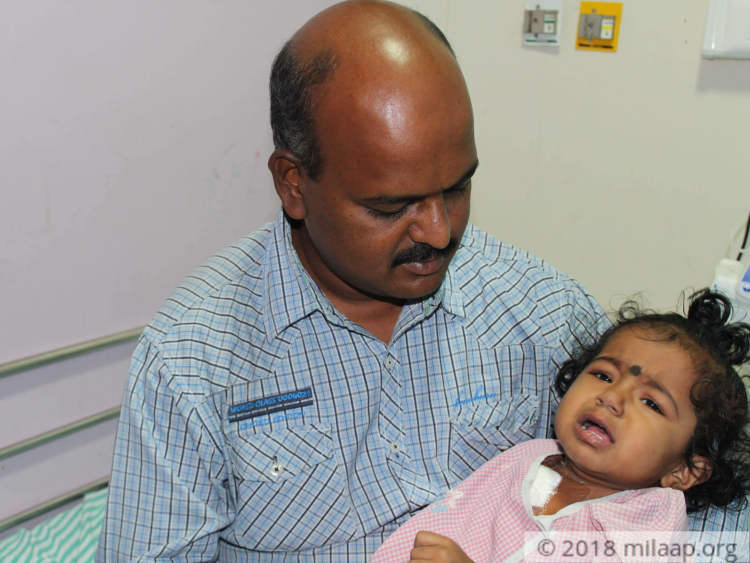 “When the doctors in Bengaluru told me that my daughter had an aggressive type of blood cancer, my mind went back to those days where I was pining for a child. All the struggles, all the pain had become real again. I had only thought in mind…I wanted to save her from this dreadful disease at any cost, no matter what I had to give up for it.”-Sridevi, with tears in her eyes. Little Supritha is more cranky and irritable nowadays, especially since she was started on chemo a month back. She flinches in pain when the chemo port on her hand is injected with medicines. She asks to be held all the time, and Sridevi obliges despite her own unbearable joint pain. “I only have one daughter – I want to be able to take care of her well. I know I am on medications myself and have my limitations to care for her, but we have no other option. My parents are old and cannot help me. My husband’s father is paralysed and his mother cares for him. It’s very difficult.”-Sridevi. 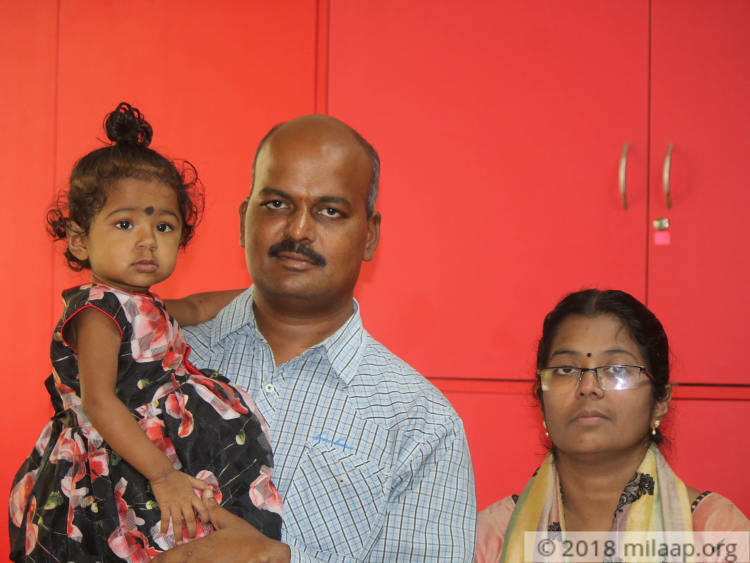 Ramesh used to work in a small private company in Krishnagiri before the family came to Bengaluru for Supritha’s treatment. His salary was just enough for Sridevi’s arthritis medicines and household expenses. But his baby’s critical illness has thrown him off balance. He has no job and no money to fall back on. “My husband does not talk to me much these days. He is worried about the hospital bills that keep mounting up day after day. He has lost his peace of mind. I want to give up my medicines (for arthritis), but who will take care of my baby if I cannot move my joints at all? We are in a very pathetic situation now.”-Sridevi. 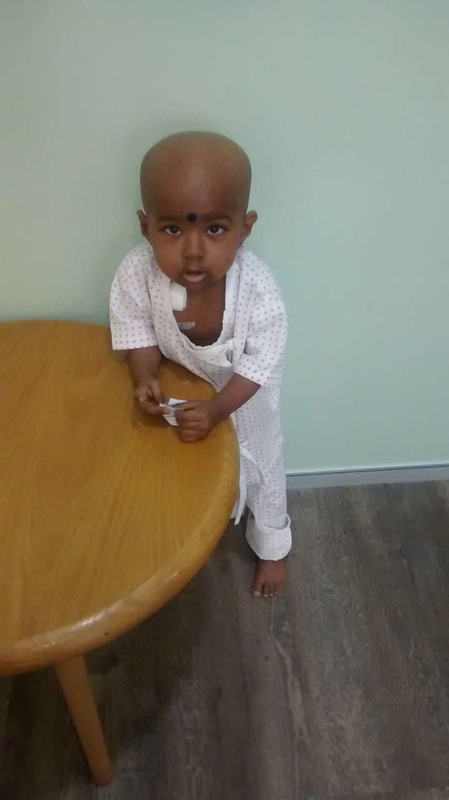 Baby Supritha needs chemotherapy along with a bone marrow transplant to survive. Her WBC and platelet levels keep wavering every now and then, so leaving Bengaluru is not an option for her family. She can be in a life-and-death situation any time because her cancer is very aggressive and severe. Without constant monitoring, anything can happen to her. Her father, Ramesh, is now borrowing from friends to take care of some expenses, but the money is not enough. He sleeps outside the hospital because he has no money to even rent a room. He needs a very big amount to treat his daughter – that is the only way she will survive. Baby of Sridevi is no more with us. Baby of Sridevi was undergoing her treatment but her health deteriorated and she couldn't make it. Here's an quick update on Baby of Sridevi. 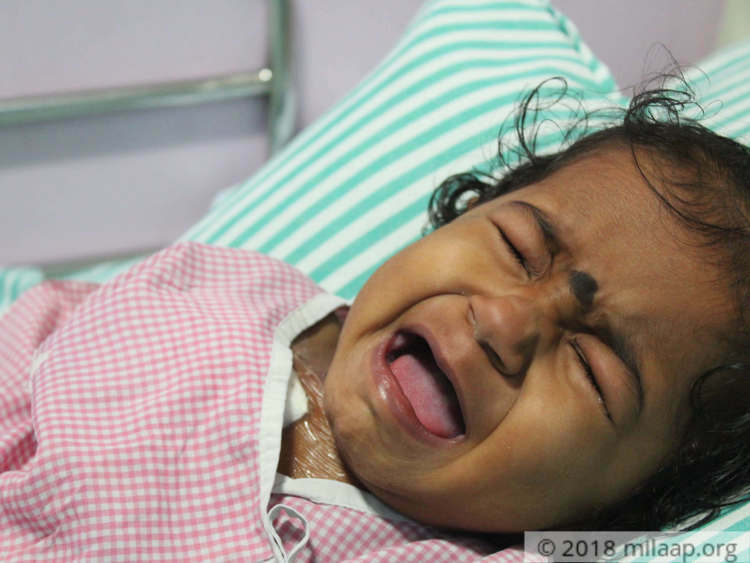 Baby had a rejection prior transplant and hence is admitted again in the hospital. She is undergoing her treatment. Doctor's will decide further course of transplant once she is stable. Here's a quick update on Baby of Sridevi. 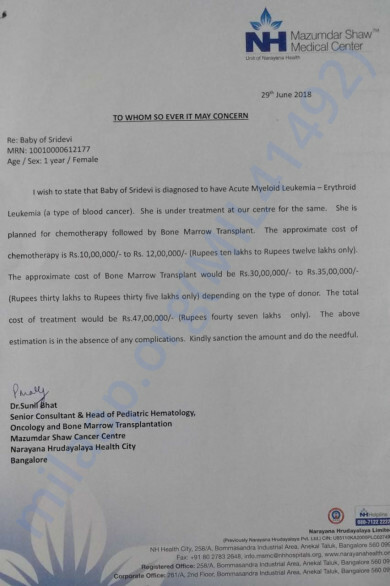 Baby of Sridevi successfully underwent bone marrow transplant and is responding well to the treatment. Here's a recent photo of Baby of Sridevi. Get well soon, may God bless you.